See our Fiji Tracks in a larger map. The letter below was originally sent to the Seven Seas Cruising Association. 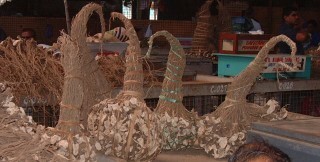 Buy some bundles of kava to take to the village chiefs before heading to out to the Mamanuca or Yasawa island groups. We've been in Fiji since October and thought we'd share some thoughts. Michael Calder's guide, "a Yachtsman's Fiji" is the only cruising guide we've found, but Mike hasn't been back since 1992, so much of his information is a bit out of date. He has OK sketch charts and good overhead photos, but no accurate GPS positions. Our electronic 2004 vector charts of Fiji seem more accurate than in Tonga (where everything was shifted about 500m or 1/4 mile) but they can still be out at times and should not be trusted completely. The Danish yacht "Tico-Tico" (not to be confused with Mady and Alain on the Belgian Tico-Tico) hit Duff Reef east of Savusavu in 2004 (in daylight!) and knocked their keel off, sinking instantly (all were later rescued). Amanda spends lots of time guiding us through reefs from the spreaders. Our charts of Suva and Savusavu seemed very accurate. The best SSB net for Fiji is the chatty "Rag-of-the-Air" on 8173 KHz at 7am local (1900z) run by Jim Bandy from Also 2. 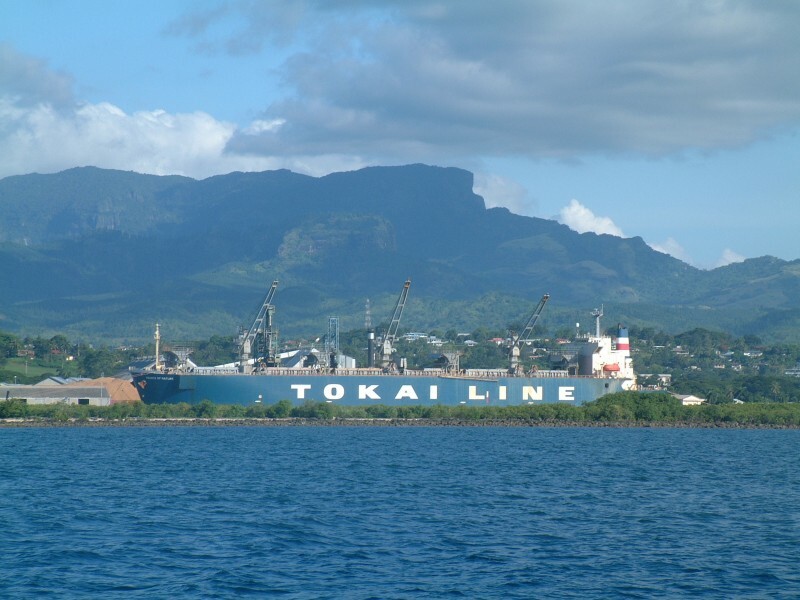 Fiji now has 4 ports of entry: Suva, Levuka, and Savusavu in the east, and Lautoka in the west. You're not allowed to stop in the Lau Group until you've already cleared in. There are no charges to clear in during normal working hours, but you only get 4-month visas. Extending visas costs $54/person for 2 more months (all prices here are as of 2005 and have been converted to US$ at US$0.60/Fj$). After that it's usually cheaper to leave the country. We didn't go to Levuka (the old capital) but the anchorage is exposed to the east and we couldn't see any marks for the channel through the reef. Since you're usually entering Levuka in the afternoon and leaving in the morning, you're looking right into the sun both times to go through the pass, which seemed dangerous to us. 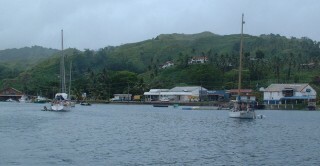 Savusavu anchorage is a creek between mainland and islands. Waitui Marina is on the right and Copra Shed is at the far left. Savusavu is by far the easiest for boats following the normal tradewind routes from the east. All officials are nearby, just behind the Waitui dock. 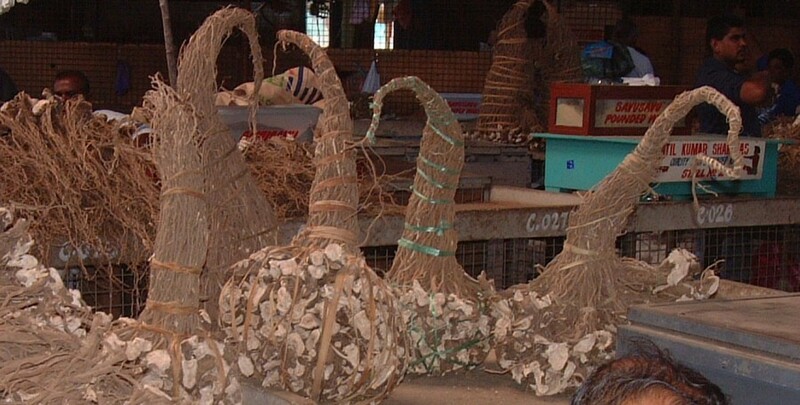 Virtually everyone picks up a mooring from either Waitui, Copra Shed, or Eco-divers (for $6/day, $34/wk, or $90/mo in 2005) as it's all about 50' (15m) deep. 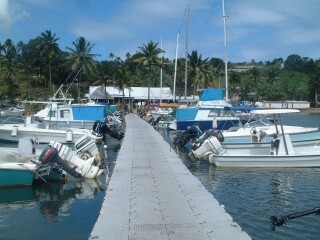 Many of these moorings claim to be "cyclone" moorings, but some are too near the wide entrance for much protection. Curly Carswell (from NZ) runs Eco-divers and serves as the Savusavu yacht-helper. He runs a local net on VHF14 every morning. Copra Shed has a small yacht shop and happy hour from 5-6pm (don't wear your hat). Those needing a burger-and-shake fix can go to Mo's Burger's behind the Waitui dock, but cheaper Indian and Chinese restaurants are available in town. (Food in Fiji was a welcome surprise after Tonga - cheap and well spiced.) Curly often organizes a great "yachtie dinner" one night a week for about $7/person. Fuel must be jugged from stations just across the road and water can be had on the docks. Cooking gas (even just topping up) is a short taxi ride. To clear in Suva you're supposed to anchor off the Royal Suva Yacht Club and await agricultural inspection. While there's no charge for the inspection, they often charge $20 to hire the boat to come out, so it might be cheaper to go to the Yacht Club that night (the officials refuse to use your dinghy). The RSYC is pleasant enough but they try to charge $3/day even to anchor, and the anchorage (10-30' in mud) is bleak and downwind of the highly odiferous garbage dump. We much preferred to pickup one of Tony's free moorings off the Tradewinds Hotel, although it's a bit further out of town. (NOTE: the hotel had some bad experiences with yachties in past years and has signs up to keep off their docks and grounds. We used both, as well as their water, pool, showers, etc., but we were careful to show our appreciation to the staff. Others did the same and relations now seem better.) Suva check-in is on the main commercial wharf, but immigration often isn't there, requiring another taxi ride deeper into town. Taxis are cheap and plentiful, but make sure the driver uses his meter. Busses are frequent and even cheaper. The RSYC has a fuel dock, washer/dryer, bar, restaurant, and a small yacht shop. Pre-mixed dinghy fuel is often cheaper than mixing your own. Cooking gas is easy but involves a taxi ride to Lami, near Tradewinds. Lami also has a yacht shop, fiberglass shop, and canvas shop. Suva has a good labor force (very welcome after Tonga) and they're cheap enough, but you must be right on top of them if you want quality. There were no sailmakers that we found. 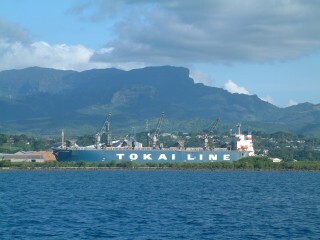 Lautoka has a small container port and beautifully majestic mountains behind it. Lautoka, on the west end of Viti Levu, is the normal clear-out point. Calder talks about anchoring off the marina, but it was blown away years ago. You can still anchor there (15-40' in mud) but there's no easy way to get to town. 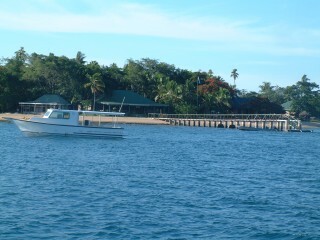 We picked up a free mooring off Bekana Resort, just 1 mile west of Lautoka. They were very nice, offering swimming pool and showers with the unspoken assumption that we'd spend some $$, so we usually went to their Happy Hour from 6-7pm, although only beers were discounted. We used Bekana as our base when cruising the Mamanuca and Yasawa Groups west of Viti Levu, and Bekana can ferry you ashore for a fee. All clearance offices are easy to get to on the commercial "Queen's" Wharf. There are some concrete steps at the base of the wharf that are handy to tie a dinghy to but you'll need an outboard to get there and a stern anchor to keep the dinghy from drifting under the bridge. This is probably the best way to access town, but it's still about 1/2 mile (1km) walk or taxi ride. Bekana Garden Resort welcomes yachties, and has a few free moorings available. Just south of the Queen's Wharf is the fishing dock which has fuel (they prefer you to take your jugs) but no water. Just across the street is Fiji Meats, which is excellent - good selection and quality - they'll sometimes even (re)trim it for you before weighing it. They'll vacuum bag and either chill or freeze your meat for you. The best liquor stores are in Lautoka, but don't expect any bargains. Fiji Bitter is a passable brew (and much better than Tonga's aptly named Ik-ale) but it's still $0.90/can. Australian wines can be had for about $7/bottle and up. We rented a car in Lautoka ($42/day) but be advised that only the main road that goes around Viti Levu is paved. Vuda (pronounced Vunda) Point has a new marina with most of what you'd expect, including dry-pit storage, but no easy anchoring and lots of mosquitoes. Navadra, in the northern Mamaucas, has wonderful, uninhabited beaches where we saw turtle tracks in the sand. We've been having a delightful time in the Mamanuca and Yasawa Islands, west of Viti Levu, even during cyclone season, but we're currently the ONLY cruising boat out here. Much of the fleet went to NZ for cyclone season, and the rest are sitting on their moorings in Savusavu, but there are good cyclone holes in Denerau (Nadi), Vuda Pt. Marina, Lautoka, and Musket Cove. We keep a close eye on the weather, but there are countless fun anchorages within 1 day's sail. Be advised that many reef markers have blown down and not been replaced, especially in the less traveled areas. In general, we've found that the Mamanuca's have better coral and underwater visibility than the Yasawa's to the north. The Mamanuca's tend to have more up-scale resorts, and virtually all islands have at least 1 resort on them. Most of these seem friendly to yachts, even though we don't spend a lot of $$. 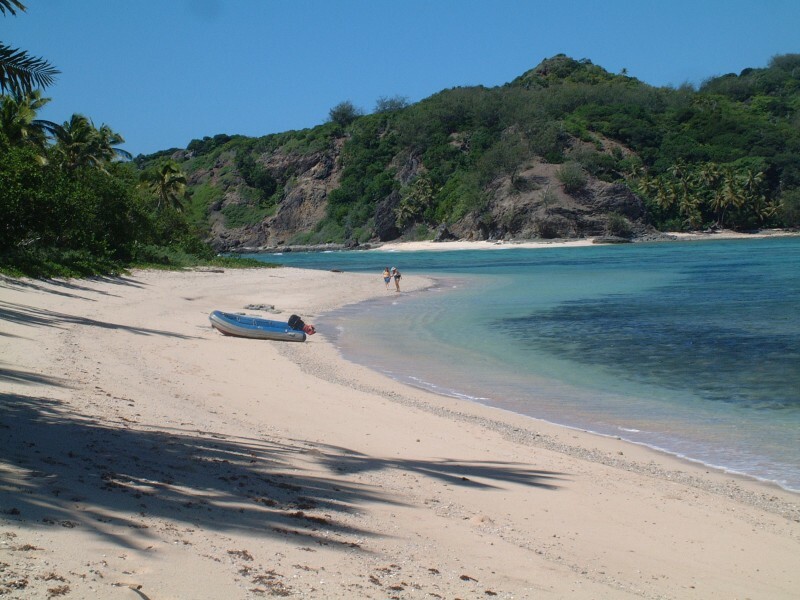 The Yasawa's are further from the mainland and tend towards lower end backpacker-type resorts and local villages. If you visit the villages, you'll need to do a Sevu-sevu ceremony with the chief, bringing him a gift of Kava. Deserted anchorages are available but relatively rare. We enjoyed several days of isolated splendor in Navadra (30' in sand but we needed a stern anchor to keep us off the reef). Musket Cove and the marina from the hill above the resort. Note the lighter color of the many reefs. The cyclone hole is right of this photo. Musket Cove (Malolo Lailai Is) has about 20 moorings ($6/day) as well as showers ($.60), the $2 bar with free BBQ pits, 2 useful stores, telephones, a small clinic, and a dive shop ($6/fill). They also have a small dock ($12/night for us), a fuel dock, and a good cyclone hole that requires a small bridge to be raised. There are paths for walking all over the island which offer great views of the surrounding reefs. Although quiet most of the time, Musket Cove is apparently the place to be towards the end of the season, as yachts gather to head west towards Vanuatu, New Caledonia, and OZ. Of the several resorts there, we preferred Plantation as they have 2 (salt) swimming pools, free showers, internet access, and tennis courts. Happy Hour (6-7) is followed by one of the best resort dinners we've found: $16 for a delicious buffet with 3-4 types of meat and a different theme each night, and a deadly desert buffet including fresh fruits, ice creams and sherbets. There's a brief cultural show most evenings. 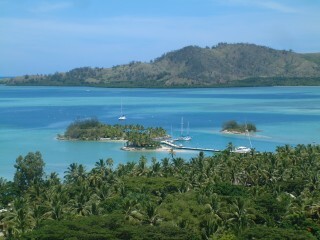 The marine reserve around Treasure Island provides great snorkeling and diving, with some of the best coral we've seen. One of our favorite resorts was Treasure Island ([E]Luvuka Is). They had 2 free moorings for yacht use, and they let us use their fresh-water pool, showers, tennis court, ice machines, and even washing machines! 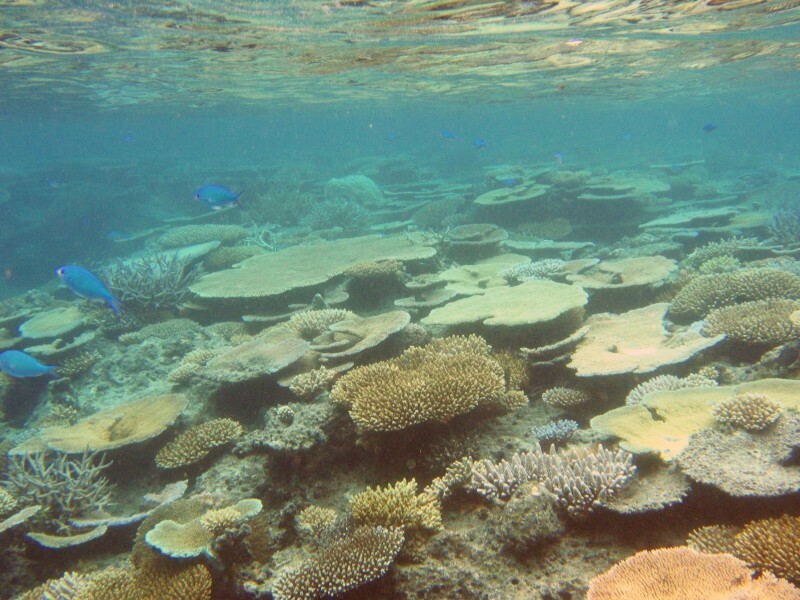 They also have the best snorkeling we've seen here, with vast fields of vibrant corals. The staff went out of their way to make us feel welcome so we tried to show our appreciation at Happy Hour (6-7). Bounty Island is more of a backpacker place, but they also had 2 free moorings and nice coral. Beachcomber was less friendly, charging visitors $3 just to come ashore. Walu Bay Resort on Malolo Is also had a free yacht mooring and were friendly. 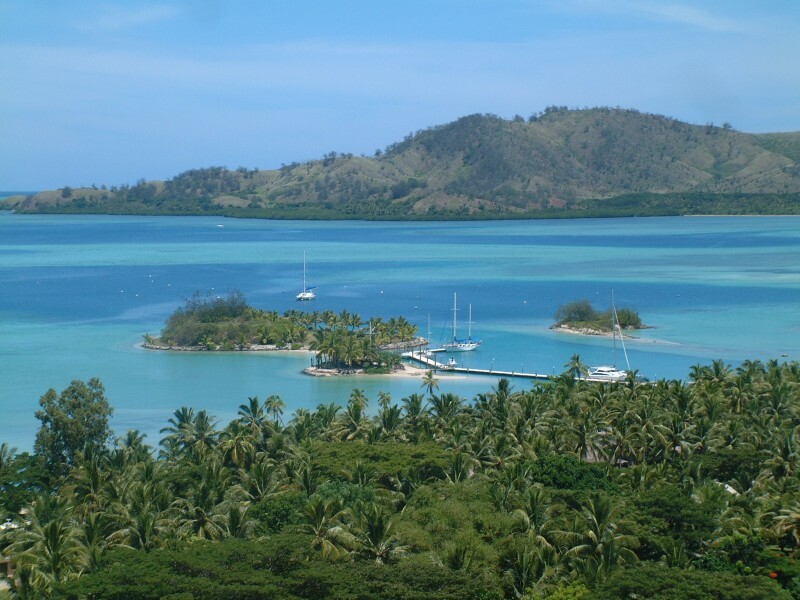 Robinson Crusoe (Likuri) Island, on the SW corner of Viti Levu is also extremely yacht friendly and should not be missed. They have the best cultural shows we've seen in Fiji, including knife-dancing and fire-dancing, as well as the more traditional sort. The staff obviously really enjoy putting on the shows, and their attitude is infectious. Meals are only $4.50 for a nice buffet, which is a steal as, Ron, one of the owners, also owns the butchery in Nadi. They do a "Lovo" (ground oven, like the Tongan "Umu") lunch 3 times a week, accompanied by fire-walking and a cultural show. Robinson Crusoe shows up as Likuri Island on the charts, about 7 miles SSE of Navula Passage (the main pass into Western Fiji). Although Likuri Bay is fairly accurately positioned, the chart has some errors: There is NO shallow spot to avoid on the way in - you could bring 60' (20m) in if you wanted - and anchorage off the island is 10-25' (3-8m) of good holding muddy sand. There's room for dozens of boats and the owners, 2 retired Aussie couples, are putting in free moorings to attract more yachts. They monitor VHF 10 and will gladly send a boat out to guide you in if you want (although it's only necessary if you arrive after dark).